The last product on our list is also one of the most respected within its field. Professionals will regularly cite Corroseal as one of the top products in the market, often suggesting that it is well worth the additional financial investment to purchase a superior performing product. One thing that makes Corroseal stand out about the other products is its viscosity. While TotalBoat and Skyco Ospho have a nearly identical viscosity, Corroseal is notably thicker–not to the point where it is impeded from being sprayed but still more than the other products on this list. That thickness gives it a few advantages in terms of performance compared to the other products reviewed. First, the Corroseal will not need to be applied as much as the other rust converters. Often, you can get by with a single application–though, you will see even better results with two. However, it is almost unheard of that you will need more than two application–even with medium rust projects. 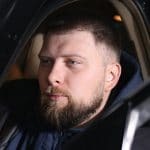 That is not a boast that either TotalBoat or Skyco Ospho can make, both of which generally require at least two applications and sometimes more depending on how corroded the project. 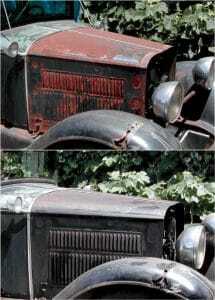 Another benefit of the thicker rust converter is that it bonds deeper and firmer with the rust. While this requires less product to accomplish the task, it also protects the metal much better than the other products on our list. In fact, Corroseal is the best rust converter we reviewed for using without another form of treatment and maintaining its protection. This product has been noted to protect from further rust by itself for well over a year. However, that performance often requires a better starting condition. While the Corroseal will work well with medium rusted metal, it still does not work as well with shingled metal. This is because the thicker rust converter does not as easily fit into the small area between the flaky rust. Thankfully, this is one of the easier cleanup as the only rust converter that washes out with just soap and water. It needs to be understood that the Evapo-Rust ER012 is not truly a rust converter. A rust converter bonds with rust and forms a protective outer polymer layer. On the contrary, Evapo-Rust is actually a rust remover. This is a different product that functions on a different principle. Evapo-Rust further differentiates itself even from other competing rust removers in that it does not utilize an acid based formula. This provides numerous benefits that acid based rust removers simply cannot compete with. 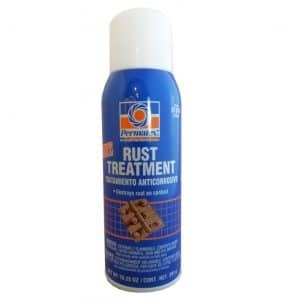 For one, Evapo-Rust is one of the safest rust removing products available. It is non-toxic, non-flammable, and biodegradable. While you likely would not want to do so, it is perfectly safe to dump remaining Evapo-Rust down the drain. However, the reason you would not want to dump the used Evapo-Rust down the drain has nothing to do with potential damage or risk to the drain. Instead, you would simply be wasting a product that you could use again. 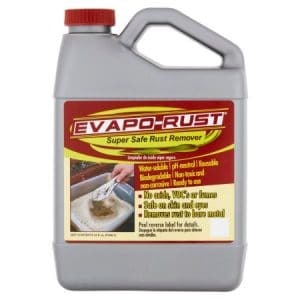 Unlike many acid based rust remover and even some rust converters, you can mix used Evapo-Rust back with the remaining product without any negative effect. Whereas some acid based rust treatment product will activate once a used amount have been returned to the original, the Evapo-Rust formula does not suffer that same issue. However, that is not to suggest that Evapo-Rust is without its faults. For one, Evapo-Rust provides no protection for the treated metals against future rust whatsoever. Granted, this should be rather apparent as the metal is not coated with a polymer but instead returns much closer to a brand new condition. Still, do not expect your metal treated Evapo-Rust to fare any better than it did before treatment. Another issue with Evapo-Rust is that it takes the longest to work. If you are using Evapo-Rust on handheld items, this is less of an issue. However, many people turn to rust converters–and even rust removers–for larger projects, projects that cannot be fully submerged as the product suggests. In this instance, you will need to regularly reapply and clean off the surface, or it will not work. This means a great deal more time, effort, and attention must be paid to this product than the other products on our list. Permatex breaks away from many of the other products on this list first and foremost by utilizing a different chemical as one of it main ingredients. While most of the products on this list and even the same products on the market that we did not review utilize a phosphoric acid formula, the Permatex rust converter is unique in using a formic acid. The use of formic acid does have the advantage that it is less toxic than some of the other products on our list, though it is by no means non-toxic. Moreover, formic acid itself is less hazardous to people in general, including when it comes in contact with the skin or eyes. Unfortunately, formic acid is not as effective in converting rust as phosphoric acid. This does not mean that Permatex is a poor product, but you will need to understand the limitation that a formic acid based rust converter presents when compared to a phosphoric acid based. For one, Permatex will not protect the treated metal without further treatments as well as many of its competitors. While many phosphoric acid based rust converters will serve for over a year without further treatment, an otherwise untreated Permatex piece of metal will be lucky to last six months. Moreover, Permatex is not able to be applied to a project and then filtered out after use, returning the unused portion back with the rest. This will actually activate the remaining rust converter and decrease its quality. Thankfully, Permatex does it least make it much easier to treat the project further after the initial application. For one, this is the product on our list that can be dispensed from an aerosol can, which makes application much quicker and easier to be more precise. Moreover, the Permatex rust converter has a much quicker drying time than its competitors, able to be painted over in less than an hour – depending on the project. TotalBoat Rust Primer is the first product on our list that actually follows the conventions of most rust converters. First, it is made from a phosphoric acid base that is the most common substance used for rust converters. Moreover, while TotalBoat Rust Primer can be sprayed from a standard spray bottle, it does not come in an aerosol can like Permatex. Regardless, this means there are a few things you need to consider before choosing this product. First, unlike the previous product, TotalBoat Rust Primer is indeed toxic. Moreover, the phosphoric acid base in TotalBoat Rust Primer is far more acidic than with Permatex. While you should definitely use protective gear with Permatex–especially protective eye gear–it is almost a necessity that you use protective gear with TotalBoat Rust Primer as getting it on your skin alone can cause inflammation and a burning sensation. That being said, each phosphoric acid based rust converter still uses a slightly different formula which affects the various qualities of the product. While TotalBoat Rust Primer is fairly thin, it also covers more surface area than any other product on our list. Granted, you will likely need to apply multiple coats to your project, but you can still get up to 500 sq. ft. of coverage out of a single gallon on lightly rusted metal. Moreover, TotalBoat Rust Primer is one of the few phosphoric acid based rust converters that can be used as a primer for bare metal. Generally, phosphoric acid based rust converters will not properly cure to bare metal and will remain sticky or flake off. 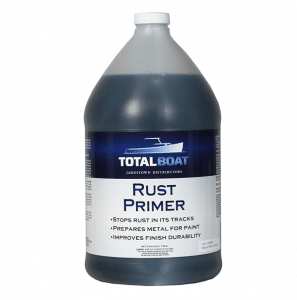 This provides TotalBoat Rust Primer an added degree of versatility. Unfortunately, this also means that TotalBoat Rust Primer has a much longer curing time than many of the other products on our list. 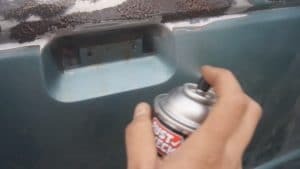 Whereas some of the other rust converters can technically accept further treatment from paints or other low-reacting treatments shortly after applied, TotalBoat Rust Primer will require the entire curing time–between one to two days–before you should apply paint or any other treatment. 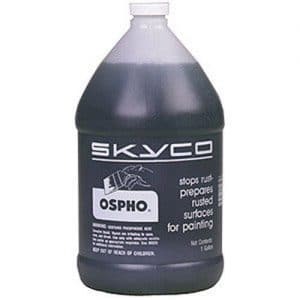 The Skyco Ospho is surprisingly similar to the TotalBoat Rust Primer. In fact, by all outward appearances, they are almost identical. However, the formula of the two are different enough that you will not get the same response from each. For instance, the Skyco Ospho, while similar in viscosity to the TotalBoat, actually covers less area. Moreover, unlike the TotalBoat, the Skyco Ospho is not especially effective at protecting the metal alone after application. In this regard, the Skyco Ospho is more akin to the Permatex rust converter, though it is still more effective than the formic acid based product. Still, Skyco Ospho hangs its hat on one thing and one thing alone: priming. In this category, it is difficult to beat the Skyco Ospho. Assuming that the project is properly prepared – another issue with the Skyco Ospho – this rust converter will bond especially well with light or medium rusted metal. Moreover, once the Skyco Ospho has fully bonded, it will serve as a much better primer for further treatment, like pain and epoxies, than most of the other products on our list. Unfortunately, time is the major investment sink with this product. This product easily takes as long to fully set as the TotalBoat, though it will often take even longer. Thankfully, you do not have to invest that time beforehand as the Skyco Ospho rust converter will work even if the project is not excessively pretreated ahead of time. In this regard, you can apply the Skyco Ospho to medium rusted metal that you would normally sand or grind down, and you do not have to worry about the rust converter flaking off. Of course, much like the TotalBoat, you will still need to apply it more than once, but it will set as is from that point on. It is important to understand what a rust converter is used for specifically. In most instances, rust converters are not intended for bare metal–though there are some brands on the market which have tweaked their formula to serve as a primer for that surface. However, it still will not provide the same future protection if used this way. Instead, a rust converter should be used directly on rust and only rust. Keep in mind, this is not the same thing as tarnish, so silver, brass, copper, and other metals without iron in them are not proper uses for a rust converter. However, steel and other iron alloys will work just fine. Finally, the degree of rusting is important, more so with some rust converters than others. Regardless, the ideal degree of rusting is medium to heavy. Keep in mind, if your project is heavily rusted, you will still need to sand or grind it somewhat smooth. Rust converters usually come as a fairly thin liquid. 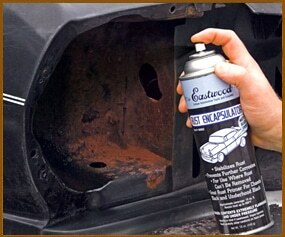 This allows the rust converter to be applied with either a brush or as a spray. Some of the more expensive brands of rust converter have even been able to turn their rust converter into an aerosol which allows both an even coating as well as saving its use and providing efficient distribution without waste. Keep in mind, while most rust converters can be painted on, different brands of rust converter will be more of less viscous than others. This presents distinct advantages and disadvantages for both. A thinner rust converter will spray much easier. If you are applying the rust converter to a long pole, it is far easier to spray it than to paint it. However, thin rust converters run the risk of dripping if too much is applied. Moreover, thinner rust converters will often require more coats of application before all of the rust is converted for an especially corroded project. Thicker rust converter has the opposite effect. It is far more difficult to spray from a bottle and will not work as well for this purpose. Conversely, a more viscous rust converter will better adhere to the surface and run less risk of dripping. It will also require fewer coats of thicker rust converters to treat the metal. In truth, all rust converters should be allowed to dry for between 24 to 48 hours. However, depending on the brand’s formula, it is entirely possible that a rust converter can be painted over after only one to two hours of drying without any adverse effects to either the rust conversion, the priming action, or the paint adherence. Depending on where you live, this may be more or less relevant. For instance, an automotive garage in the Southwest United States will not have any issues letting the rust converter cure for one or more days. On the other hand, a user in the Pacific Northwest and Caribbean Southeast may not be as fortunate, having to deal with rainy or humid conditions that can change in the span of an hour. Depending on the active agent of the rust converter, cleanup can be a snap or require significant effort. Most rust converters are made from a phosphoric acid base that contains various other compounds to affect it different properties. These rust converters will often be the most difficult to clean. Granted, the difficulty of cleaning any rust converter, even phosphoric acid based, will depend what you are cleaning it off of. For example, even the most difficult to clean rust converters will generally come off rather easy from a stone based driveway if you hose it down long enough. However, the same cannot be said if that rust converter gets on your hands or clothes. In this instance, the rust converter is liable to stain your clothing forever and your hands until the skin has naturally shed on its own. That being said, there are some rust converter brands that make it a point to tweak their formula so that you can easily clean it up with soap and water. Still, there is another reason to wary of getting rust converters on your hands. 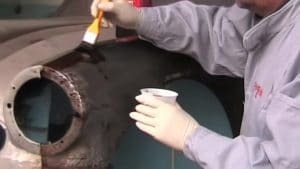 Since many of the most popular rust converters are made from a phosphoric acid, it will burn you if it comes into contact with your skin and will continue to burn if left there. Keep in mind, this is not a nitric or sulfuric acid burn–you will not have to worry about scarring or blisters. However, direct contact with skin will often cause discomfort, irritation, and inflammation. As such, it is advised that you use a pair of gloves, often rubber, when applying a rust converter. In terms of flammability, not all rust converters are equal. Some rust converters include additives that are specifically designed to make them non-flammable–including the ones with phosphoric acid as the active ingredient. However, aerosol rust converters are almost always flammable due to the compressed nature of the product. 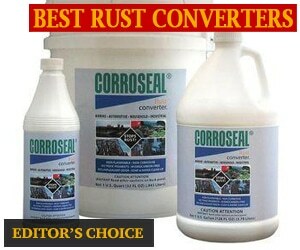 Ideally, you will seal, paint, or otherwise treat the metal after you have applied the rust converter and it has cured. However, there are some brands out there that can hang their hat on the boast that their rust converter will protect against future corrosion absent any further treatment. These products are few and far between and even they have their limits, but some of rust converters are essentially more durable than others. While it is not a standard of measurement for durability, more viscous rust converters have a tendency to be more durable than their thinner competitors. However, individual formulas can weigh just as heavily in this regard once all of the rust has been converted–regardless the product’s initial thickness. As we can see, the best product for the job will depend on the job you have in mind. 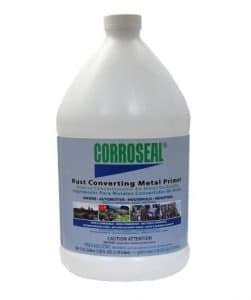 If you need a heavy-duty rust converter, then your best bet is to go with the Corroseal which is both one of the most durable and acts as a great primer. Speaking of primer, the Skyco Ospho may not provide the absolute best rust converting action, but it does serve as the best metal primer on our list–though that is the only category, outside of price, that the Ospho beat the Corroseal. If you are looking for something a little less toxic, the Evapo-Rust is biodegradable, non-flammable, and non-toxic–though it is not actually a rust converter and cannot be used as a primer. Still, the Permatex uses a formic acid that, while not as effective as the phosphoric acid rust converters, serves as a good midway point between the Evapo-Rust and the other products on our list. Any chance you could add GEM Rust Killer to the review of rust converters. Small company in Houston. Called them yesterday and the owner answered. Been using it for years. Good pricing too. Gemplers rust converter coating looks a lot like the Corroseal, it works great, can spray it, shoot it or brush it, comes out gloss black when it finds rust. I note that Corroseal, which in my experience is very effective on rust alone, has some limitations. 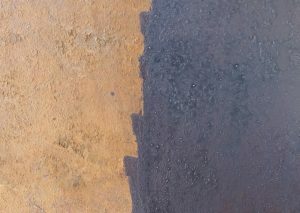 Namely it will not hold and neither will a top coat hold, if the rust converter is placed on a surface that has no rust. My truck box underbelly is a good example. I have some rust on the rails but only intermittently. Spraying a covering of Corroseal over the entire rails I am told, will not hold in those places where there was no rust. Hence, I am leaning toward using phosphoric acid in areas with mixed rust and decent paint coating already in place. Then washing the acid off after it has cured, prior to then top coating the entire area. Any suggestions for other contenders in areas not entirely covered by rust?